Historic original pinback button celebrating the Apollo VIII mission. 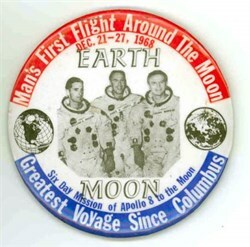 It measures 3 1/2" in diameter and shows a photo of the 3 astronauts, William A. Anders, James A Lovell and Frank Borman, each with their name on their picture. In red print it reads, "Apollo VIII - Man's first flight around the moon December 21 - 27, 1968". Around the border it reads, "Greatest voyage since Columbus". The button is in very good condition and is over 37 years old. Apollo 8 was the second human flight in the program and the first human lunar orbit mission. It was the first manned flight using a Saturn V launch vehicle. Astronauts Frank Borman, James A. Lovell Jr. and William A. Anders became the first humans to see the far side of the Moon. The mission achieved operational experience and tested the Apollo Command Module systems, including communications, tracking and life-support, in cislunar space and lunar orbit, and allowed evaluation of crew performance on a lunar orbiting mission. The crew photographed the lunar surface, both farside and nearside, obtaining information on topography and landmarks as well as other scientific information necessary for future Apollo landings. The Apollo 8 spacecraft consisted of a Command Module similar to Apollo 7 except that the forward pressure and ablative hatches were replaced by a combined forward hatch, which would be used for transfer to the Lunar Module on later missions. The spacecraft mass of 28,817 kilograms (63,531 pounds) is the mass of the Command and Service Module, including propellants and expendables. A Lunar Module was not used on the Apollo 8 mission, but a Lunar Module Test Article which was equivalent in mass -- 9,027 kilograms (19,901 pounds) -- to a Lunar Module was mounted in the spacecraft/launch vehicle adapter as ballast for mass loading purposes.